I embarked on a journey to understand how the young men that I cared for in my Young Men’s Health Clinic at the Boston City Hospital were impacted by their violent injuries. This led me to interviewing young black men that had been shot. My journey was not just one of learning the intricate lives of these young black men, but also one of exploring my role as a caregiver and a black man. Young black men are most often victims of violence and crime. But to read the popular press you would never know it. Somehow we have all accepted the notion that young black men don't get shot - they get themselves shot. Because of this prejudgment, the stories these young men have to tell and the lessons they have to teach, are seldom heard. 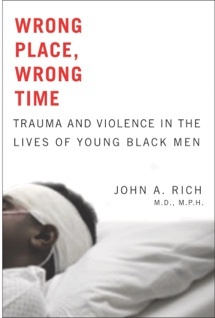 Wrong Place Wrong Time retells the stories of young black men who I met and interviewed after they had been shot, stabbed or assaulted and brought to Boston City Hospital. Kari, Mark, David, Baron and Jimmy - each with a different perspective and story - open their lives and hearts to reveal the physical and emotional wounds of their injuries. They go further to tell of their early life pain and the searing logic of the streets that shapes how they react to threat. Another voice - that of Roy Martin - helps to interpret the rules of the neighborhoods that he and these young victims hail from. Roy, a reformed gangster and drug dealer, whose life has been filled with pain, disappointment and violence, is able to decode these stories without seeking to justify the sometimes catastrophic paths that these young men take. In the end, the book takes the reader inside of a world of experience that is more complicated than would seem from the outside. This journey leads to a call to focus on the trauma and safety of these young men as the primary means to interrupt the cycle of violence.